The diamond dove belongs to the class Aves (all birds) , the order Columbiformes (pigeons, doves, dodos, and solitaires), the family Columbidae (pigeons and doves), and the genus Geopelia which includes five small, long tailed doves that eat grains and live in the relatively open savanna and semi-arid regions in Australia and Indonesia. One of the five species, the zebra dove, has a range that extends into the Southeast Asia mainland. Four of the species have barred plumage while one, the diamond dove, has spotted plumage. The diamond dove is sometimes known as the little dove and the little turtle dove. The diamond dove is one of the smallest of the Australian doves, weighing only 23 to 32 grams and has a length of 193 to 213 mm. 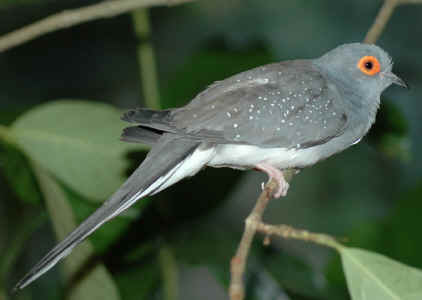 It has a gray body and the adult bird has white diamond specks on its wings. The eyes of the adult bird are set off by a pronounced orange ring. The adult birds can often be sexed by the thickness of the eye ring and the color of their wing feathers. The males have a silver gray color and an orange or red eye ring of 2-3 mm in thickness after an age of one year. The females tend toward a brown gray color and have an eye ring of about 1 mm in thickness. These doves feed on seeds, primarily from grasses. They may also eat some ants. They feed on the ground in pairs or small groups, to winter flocks. They always need to be near drinking water. The diamond dove is native to the dry central deserts of northern and central Australia. Periodically it moves out to the southern and eastern coasts, perhaps when there are particularly dry periods in the center or when favorable conditions result in increase population levels in the deserts. It prefers open terrain and sometimes but sometimes can be seen around developed areas such as parks or gardens. It's habitat is usually close to watercourses. Diamond doves in Australia seem to be able to withstand a wide range of temperature due to geographic location and seasonal variations. Alice Springs, located near the center of this map, has summer time highs near 98 degrees F (record highs around 110 degrees F) and winter low temperatures of around 37 degrees (record lows of 23 degrees F). It should be noted that temperatures are not the only limiting factor in diamond habitat but generally diamond are not found along the southern coasts where temperatures can reach freezing. 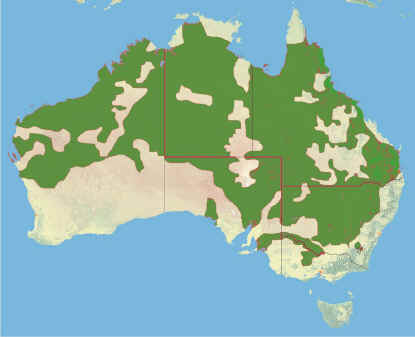 Both Gibson, Barnes, and Cox's (2) and Goodwin's (3) books display range maps which includes most of the entire country except thin strips along the south and eastern coasts. The male diamond dove usually begins the mating sequence by finding a nesting site and then repeatedly call (advertising call) for a female to join him and start building a nest. If he can persuade the female that he has an adequate nesting site then he will start carrying twigs and straw to the site while she arranges the material in a way that will withstand the weight of the parents and the babies Nests are fragile affairs often made up of interwoven gasses and/or twigs. Later, on the ground, the male will display his tail feathers like a fan, while touching his beak to the ground, and cooing at the same time in the presence of the female. After repeating this action the male will mount the now crouched female and using his wings for balance, mating will take place. After mating the male will utter a long series of one note coos and the female will often freeze in place while these coos are being uttered. I have not seen this series of coos documented in any of the literature however it seems to be a common practice with all our males. But there are some other sequences that may also take place. Sometimes the male will puff up his feathers and strut around in the presence of the female, stop, puff his feathers up further, then repeat the cycle. Diamond doves have a variety of calls. There seems to be a long distance communication call consisting of two long coos, a pause, and a long, short, and a long coo. These call also seems to be shortened into a two long coos. Birds in captivity will imitate other calls made by humans. Then there is a one or two note call used by a male to get a female to come to a nest. Then there is the "bow-coo" used by the male in the presence of a female as mentioned above. After mating the male will give a series of very short coos having a frequency of around two per second and lasting for a minute or more during which the male and female both remain still. Only the beak on the male moves. There is an alarm coo which may be several short but loud coos when danger approaches. Diamonds seem to be a very affectionate bird. When one bird of a pair returns to a nest they often great each other with very low, raspy coos. At night, if they are not nesting, they always cuddle with each other and then "kiss" by giving the other bird a series of very rapid light pecks around the neck and head while slightly shaking their wings. When the birds become separated they will make a two note call until they become reunited. Two white eggs usually laid one day apart. The eggs are incubated from 13 to 14 days. The male will sit on the eggs during the day and the female will sit on the eggs at night. Sometimes both birds will sit on the nest together, especially toward the end of the incubation period. The young are hatched without feathers but are fully feathered within a week and are flying within 12 to 14 days after hatching (2). The parents feed the young regurgitated food for the first two weeks as the babies usually take two weeks before they are able to peck sufficient food for themselves. Caged babies usually have to leave their parents around day 20 though some stay considerably longer. In captivity diamonds live 10 to 14 years or more. We had one pair that lived about 21 years. I have also head that others have had diamonds that lived into their twenties.. The diamonds were imported to Europe in the late eighteen hundreds. They were raised in the London Zoological Garden as early as 1868. They were also raised in Denmark and France. Now they are raised throughout this country and have become one of the most popular of aviary birds and is an excellent choice for those just starting. They do not require special insect food, rarely get sick, and in large aviaries (not small enclosures like cages) can usually be kept with other small, peaceful, birds such as finches. Over the years that diamonds have been kept in captivity, breeders have been working to develop birds with a variety of colors. According to Brown (1) there are 27 colors available.